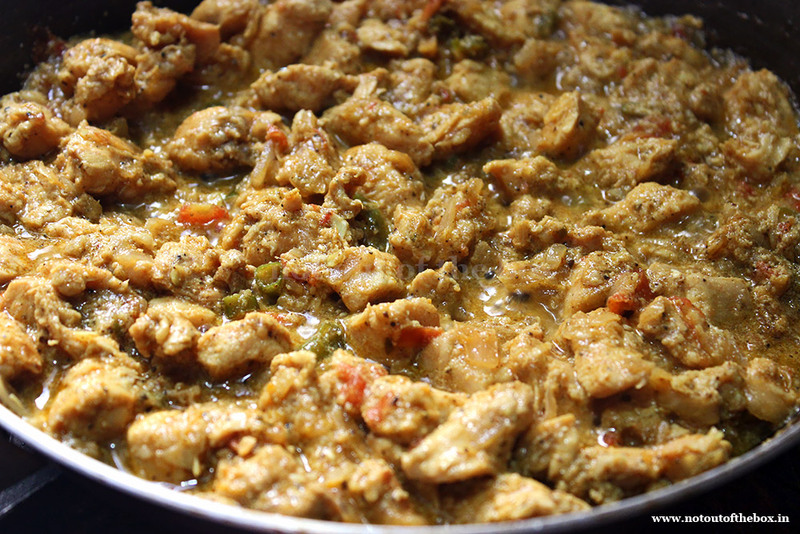 Marinate the freshly washed chicken pieces with the all the ingredients mentioned under ‘Marination for Chicken’. Keep aside for minimum 1 hour or more. Heat oil in a frying pan. Add sliced onions, sauté over medium heat until light brown in color. Add chopped tomatoes, green chillies and other ingredients except garam masala powder. Mix and cook for 2-3 minutes, now add the marinated chicken pieces. Mix well, cover and cook on low flame for 10 minutes. Keep stirring in between. Add ½ cup of water. Cover and cook until the chicken is done, stir in between. If the chicken is drying too much sprinkle some more water. Add garam masala powder at the end. Mix and remove from the heat, keep aside. In a bowl add all the ingredients (except water) mentioned under ‘For the paratha dough’. Mix well using your fingers. Now add water slowly, and knead a very smooth dough. Make 3 or 4 equal sized balls out of it. 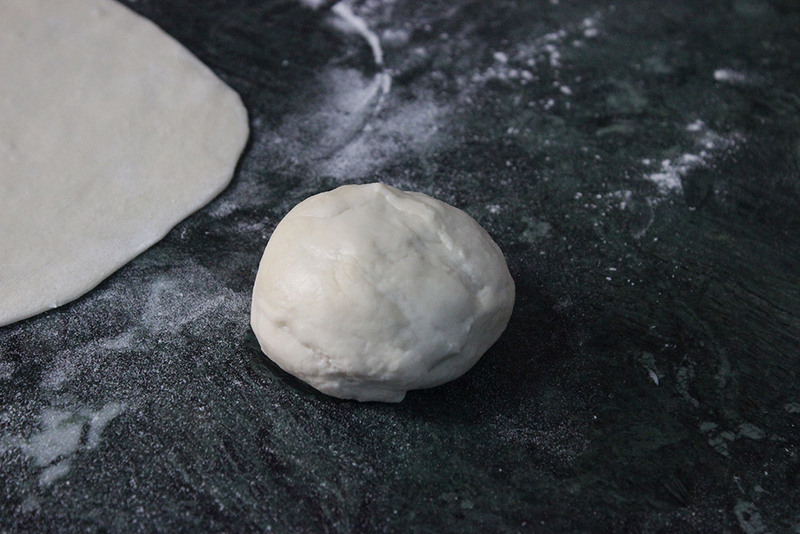 On a lightly floured surface roll out each ball into a round paratha (the thickness should be a little bit more than the regular chapatis or rotis). Heat a tawa, now cook the paratha one at a time. Flip and cook both sides without oil first (cook for a minute in total), now add 1 tbsp oil for each side, flip and cook until light brown spot appears. Avoid too much flipping, the parathas might get chewy. Remove from the heat, keep aside. Now on a hot paratha arrange some cooked chicken pieces in a row (make this line little apart from the centre). Drizzle some lemon juice all over the chicken pieces, garnish with some sliced onion, cucumber, and chopped coriander leaves. Add a few drops of tomato ketchup and chili sauce. Roll the paratha firmly, and wrap one half of the roll with tissue paper. Fold the bottom part of the tissue paper inside the roll. Your street style Chicken Roll is ready to eat. Enjoy! 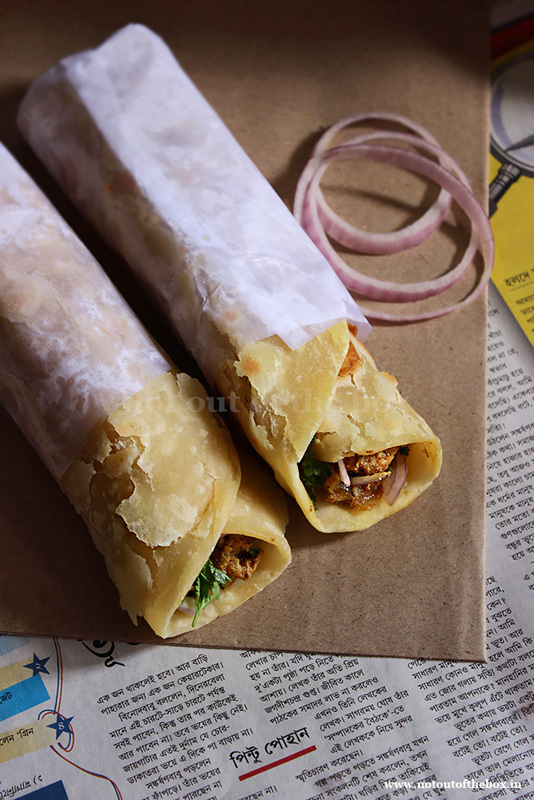 Chicken Roll is a popular street food of Kolkata. 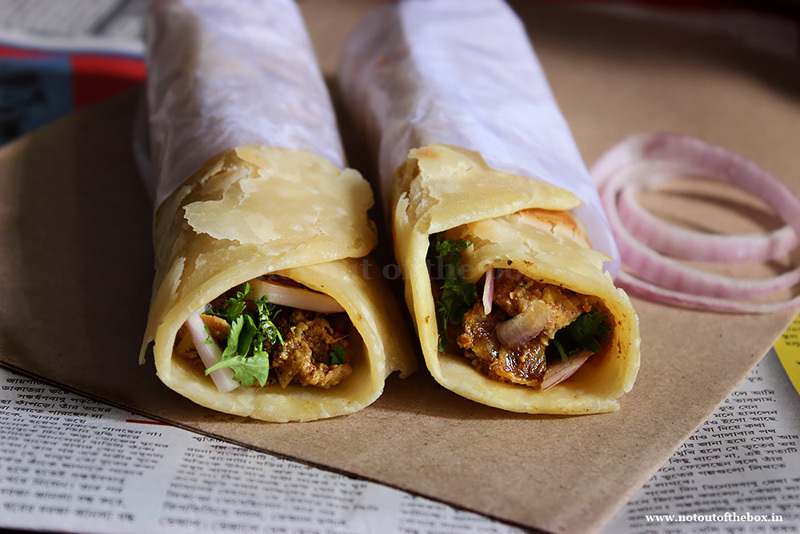 Crisp, flaky parathas wrapped with a spicy chicken filling inside this food has Bengalis heart in it. Heat oil in a frying pan. Add sliced onions, sauté over medium heat until light brown in color. Add chopped tomatoes, green chillies and other ingredients except garam masala powder. Mix and cook for 2-3 minutes, now add the marinated chicken pieces. Mix well, cover and cook on low flame for 10 minutes. Keep stirring in between. Add ½ cup of water. Cover and cook until the chicken is done, stir in between. If the chicken is drying too much sprinkle some more water. Add garam masala powder at the end. Mix and remove from the heat, keep aside. Now on a hot paratha arrange some cooked chicken pieces in a row (make this line little apart from the centre). Drizzle some lemon juice all over the chicken pieces, garnish with some sliced onion, cucumber, and chopped coriander leaves. Add a few drops of tomato ketchup and chili sauce. 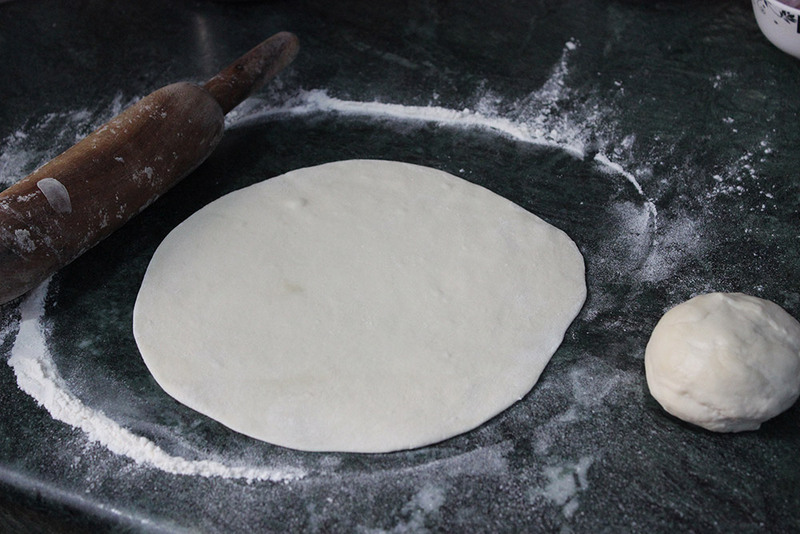 Roll the paratha firmly, and wrap one half of the roll with tissue paper. Fold the bottom part of the tissue paper inside the roll. 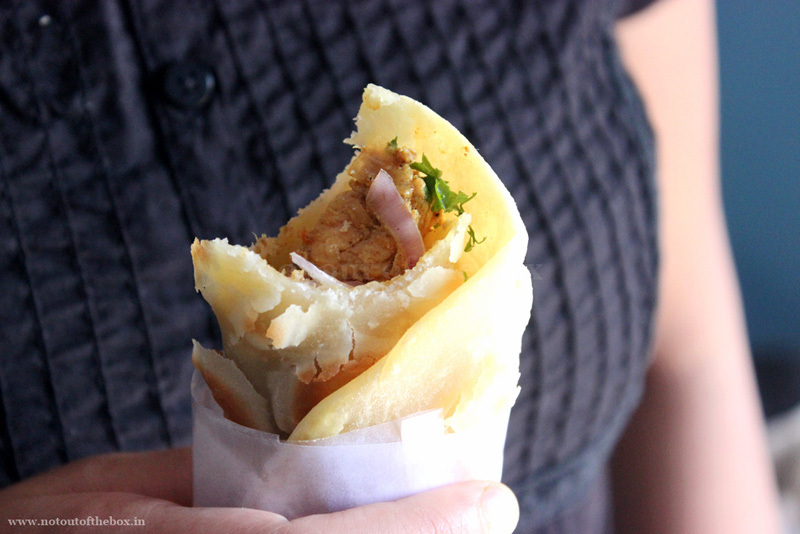 Growing up in Kolkata, have very fond memories of delicious chicken rolls. This one turned out great…thanks!